Floorplanner does what it says on the tin, or the home page. The basic level is free but you are restricted to one floor plan, which I guess is fine if it's just you designing your home. There are a few feature restrictions but nothing too major - not being able to print to scale is the one that's a pain to do without. This Floorplanner review is part of the Free Floor Plan Software series. Floorplanner is all online so there's nothing to download. There's the typical sign in first step (with your email address or through Google - no Facebook login) and then you can get going quickly. You can view the floor plans you design on the Floorplanfinder app available for ipad and iphone. I don't think there's an app available for android just yet. I'll let you know if I hear that one becomes available. Floorplanner is integrated with an iphone app called MagicPlan. 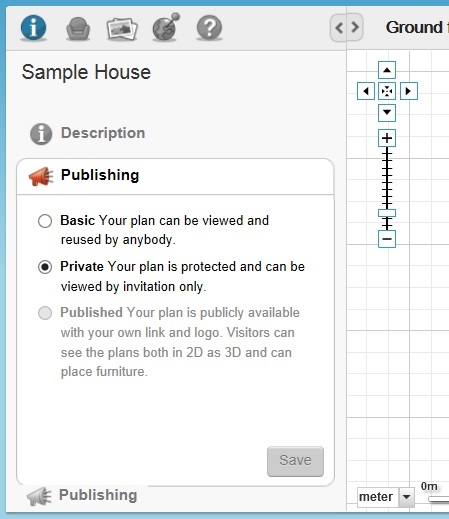 You can use MagicPlan to draw the outline of a room and then upload it into Floorplanner to tweak the design and decorate. I've had a bit of a go with MagicPlan and I did not find it as easy as taking a picture. Still it's an interesting idea for getting a rough floor plan done quickly on the go. Drawing floor plans with Floorplanner is really user friendly and intuitive. To make the walls there are two options. One is to draw out a room directly (a box) and the second is to draw single walls. I find it way more convenient to draw out rooms instead of walls. I tried to make a room using single walls, and the edges did not connect properly. The single wall option is handy if you want to put in a partition wall or a half wall in a room. It's also necessary to create lots of short walls to make up a curved wall because there's no curved wall option. Once you make a room, it is very easy to distort the shape of the room as well. You can change the placement of the corners and create an irregular shaped polygon room. The dimensions are displayed when you drag the walls. There's no option to manually enter the dimensions, and getting an exact dimension becomes frustrating. If you're trying for 4m you'll get 4.01m or 3.99m. You can work in meters or feet and change between them at any time. The area isn't automatically calculated, so you need to get out your calculators for that. It is very simple to add windows, doors and stairs. It is also easy to change the direction of openings, as well to change the width, height and placement of the windows. How do you clone a floor on Floorplanner? I think cloning is a really important feature for floor plan software. It took a while to figure it out, but here are the steps to clone a floor on Floorplanner. It's not obvious. Have a read of these steps and the screenshot below. Top tip - Think about when you clone because everything is cloned - walls, doors, windows, furniture. Open the floor that you want to clone and hover over the arrow next to that floor label. You'll see a two little pages icon - it's in white in the screen shot below and there's the 'duplicate' help text. The location of my mouse disappeared when I took the screenshot. Choose the floor that you created in step 1 to clone the design to. Adding the furniture is fun. Not only do the cartoonish plan drawings of the furniture look interesting, but it is also very easy to change the size, position and placement of the furniture. Duplicating the furniture is also very easy and helps to create the same kind of furniture or a row of potted plants. The furniture is divided amongst the type of room and there's a search option to find the exact kind of furniture you're looking for. There's a bunch of plants and accessories you can choose from as well. I was kind of impressed by the way the shadows were created as well as the neatness of the walls and the windows. The quality of the furniture in the 3d view was kind of a letdown. I noticed that 3D rendering was a feature in the paid versions so maybe this the 3D they offer in the free version is a watered down teaser. Also, the navigation system to control the zooming and panning made it frustrating to get it into the right position. I didn't spot a walk-through feature in the free version or the feature list of the paid versions. I've mentioned in some of my other free floor plan software reviews that I like to be able to get inside the rooms as well. If you go to the projects page (Dashboard --> Projects) there's an option to 'Open in Roomstyler' which looks to be a sister site. I had a go at doing this and, sure enough, Roomstyler opens and you can decorate and produce 3D images of rooms. The weird thing is, only the floor plans come across and none of the furniture. I'll have to do a Roomstyler review at some stage. It is very easy to save your project. Floorplanner constantly reminds you that there are new changes made into the plan, and asks if you would like to save the project. If this bugs you can can turn the automatic save off in the settings menu (the little spanner over in the right hand corner). 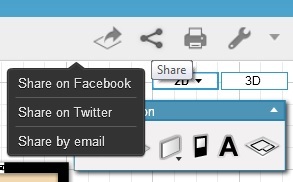 You can share your design through Facebook, Twitter or through email. To share click on the icon with lines connecting the dots. It's also worth mentioning publishing here. First of all, click on the 'i' button towards the top of the left hand panel, then click the publishing button at the bottom of the left hand panel. Then you can pick your publishing settings. I looked around for where these publishing settings might be used. I don't know for sure but I think you send an invitation by going into the projects area (click on 'dashboard' then 'projects') and clicking on 'Actions' and selecting 'copy to user'. Importing an image to trace on top of is really handy if you already have a copy of the floor plans, say from a real estate brochure that you want to use to get you started. How do you import an image into Floorplanner? The import option is in the weirdest place. Follow these steps and check out the screenshot below. Open the construction menu - way over there on the right hand side of the screen under the 2D / 3D boxes. Click on 'drawing properties' the option furthest to the right. There you go - a browse button where you can select in a jpg, png or gif file and upload. As well as publishing that we went through above you can export a plan in an image format (a low resolution jpg), or a pdf format. Floorplanner sends the exported image to your email box. This software allows you to print out images of your work. It has a set scale (a small scale at the bottom, to give an idea of the measurements). However, you can't set your own scale. Help was available through forums, a user manual, video tutorials and by directly contacting the help team. It's completely free for one plan, which for most of us amateurs working on our own designs is fine. There's a floor plan viewer available on the ipad and iphone (nothing on android just yet). They are also integrated with MagicPlan. It is easy to use, although in parts this Floorplanner review has turned more into a 'how to' because some of the features are hard to find. I can't help thinking this must be easy to fix, or maybe it's in the paid version. Please make it available in the free option. Nice renderings. Open your plan in sister site Roomstyler to get into the rooms themselves in 3D. It's a bit hard to find. See the instructions in the 'Import' section above. Not really. There is a scale placed on the print outs but you'll need to upgrade to the paid version to be able to set your own scale. You can export in jpg or pdf. What do you think of Floorplanner? I'd love to hear about your experiences using this software.